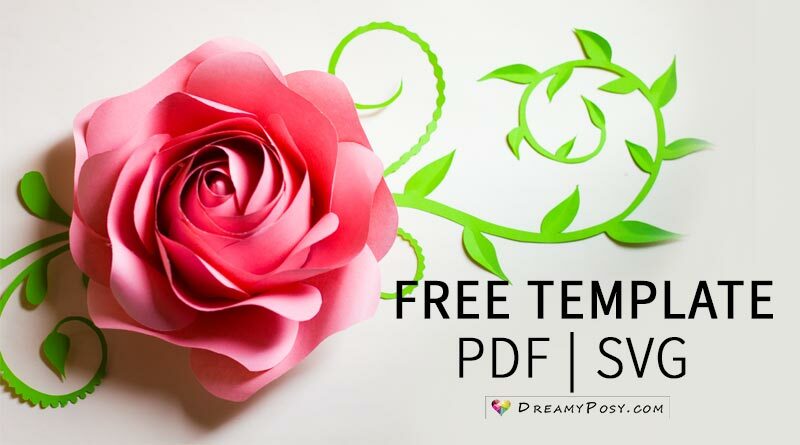 Here is the basic instruction to make any giant paper flowers and the collection of my giant paper flowers tutorials and templates … some are so easy to make with simple tools and some need more steps and equipment. 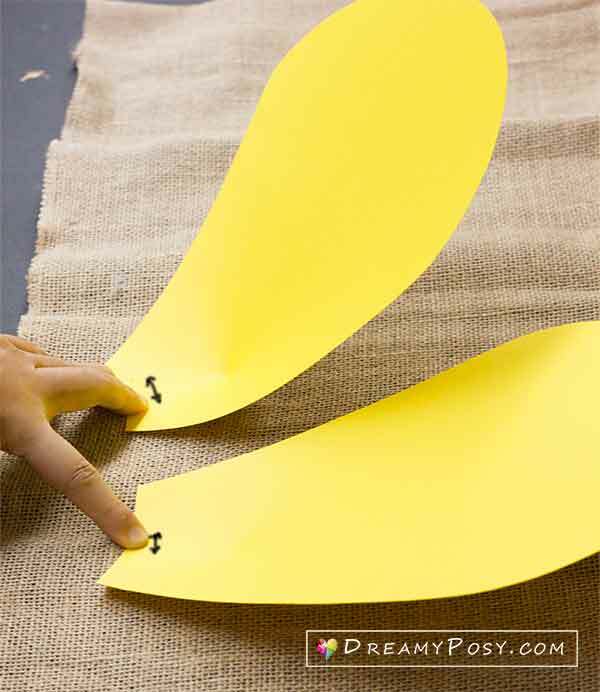 Well, let’s start with the basic instruction to make a giant paper flower so that you can create any other paper flower backdrop. 1 . 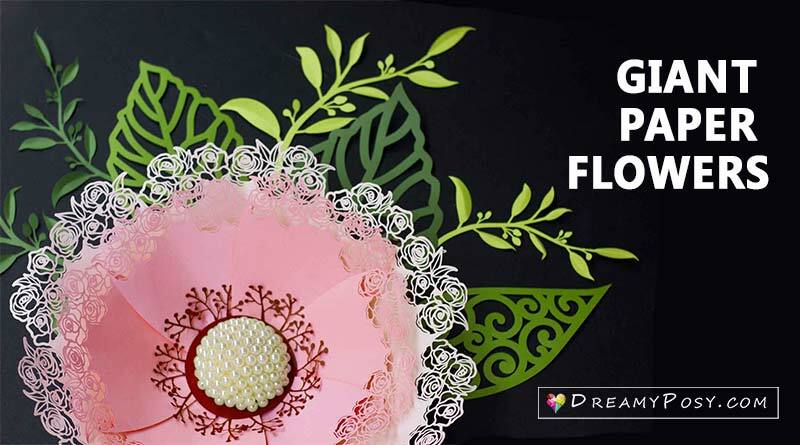 Giant flowers are created from layers. Depends on your style, the number of layers could be 1,2,3,4,5 to a lot, hehe. Please scroll down below to see the examples. 2 . 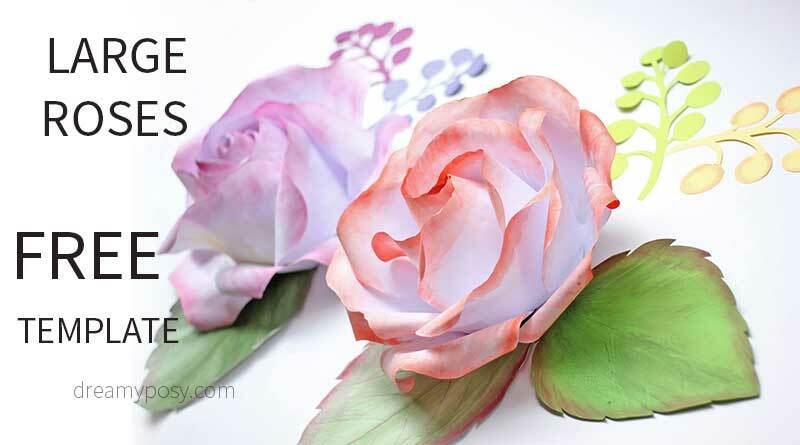 You can create the layers with different sizes or the same size of petals. 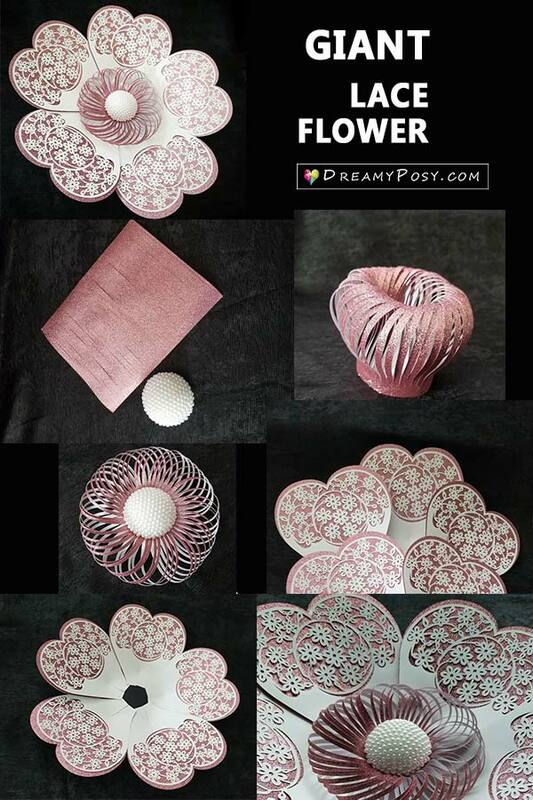 And each layer may have from 3,4,5,6 to 10 petals, depends on the petal designs. Just try and try different ways to find out which one works best. A little change could be a big creativity to your flowers. 3 . 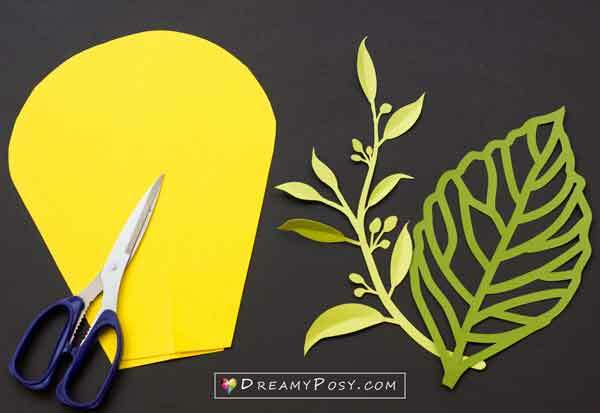 Cutting the petals: For the petal that has a simple shape, it’s better to use your scissors, as you can cut multi-petals at once. 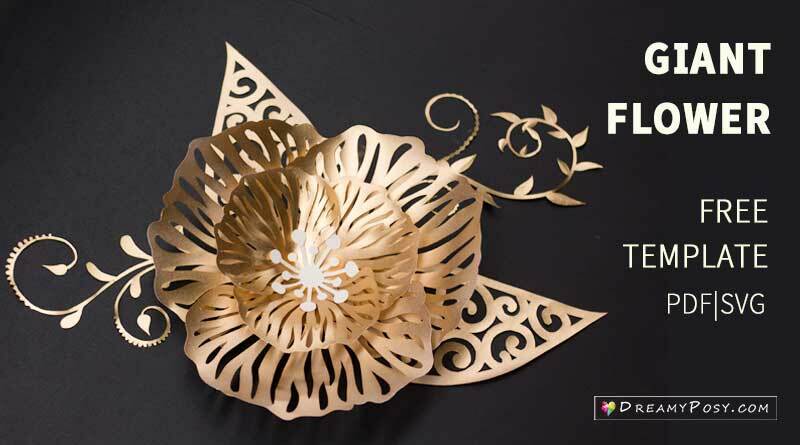 For the petal with intricated cuts, please consider using the cutting machine like Cricut or Cameo. 4 . In many cases, we will have to cut a small split cutting at the bottom center of the petal. 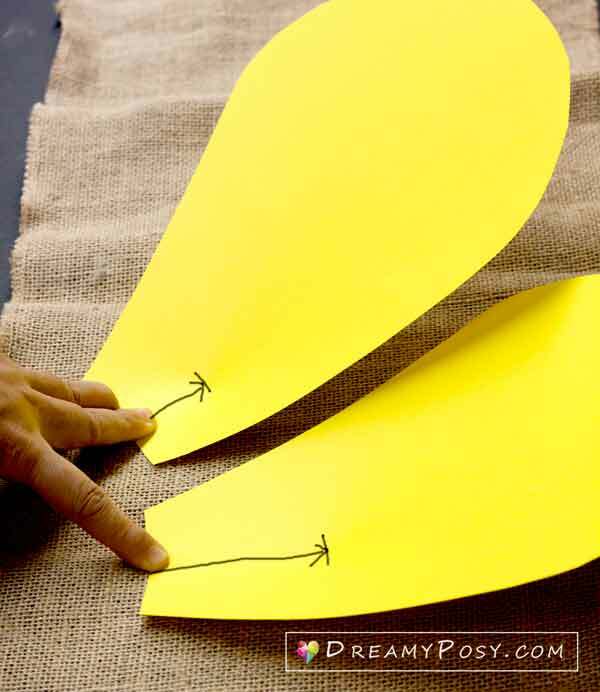 This cutting splits will help to form the petal. There are 2 factors that are very important in this step: the depth of the cut and the overlapping of the cut. I preferred to cut the shallow cut (4cm or 1 1/2 inch) and adjust the height of the petal by the overlapping. But sometimes, a deep cut is necessary for a softly blooming rose. Just play around with this tip. 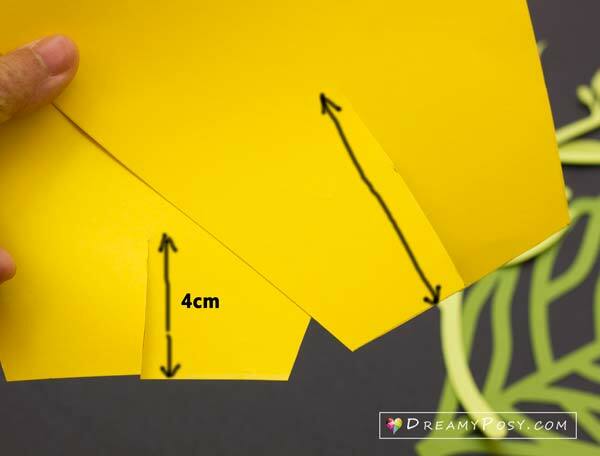 As seen in below pictures, you can see that 2 same size petals will have different height due to the depth of cut or the overlapping of the cutting splits. Now you can see: the higher petals should be for the inner layer and the lower petals should be for the outer layer. 4 . 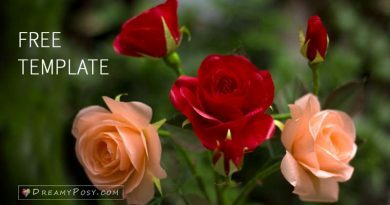 The distance between layers will decide how your flower look, it’s blooming flower or just a closed flower. 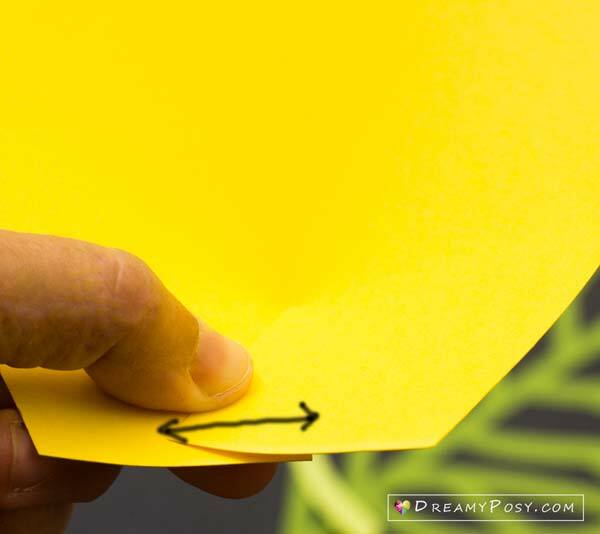 You can easily adjust the distance of the flower by adjusting the cutting split in step 3. 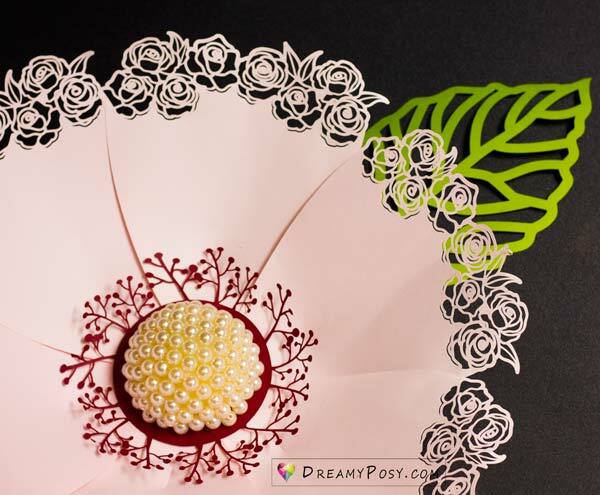 As below 2 roses, made from the same petal template. Here is the 4-layers-rose, each layer has 5 same size petals. The distance between the layers are far, so the flower is blooming. Here is the 5-layers-rose, each layer has 5 same size petals. The distance between the layers are close, so the flower is tight and closed. 5 . Center of the flower. 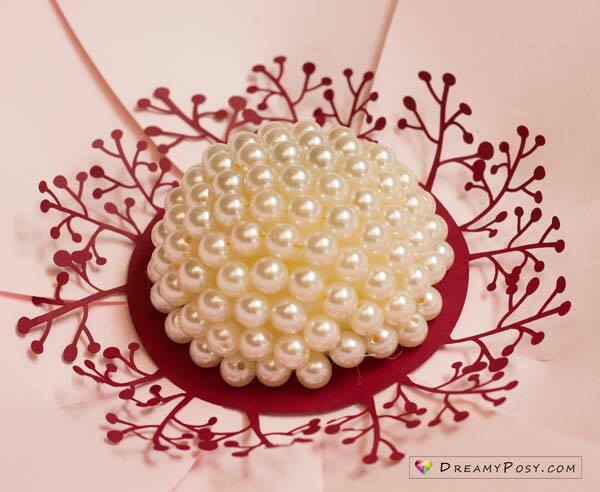 This center is made from a half sphere of foam, then cover with a pearl chain by the glue gun. And the paper layer was cut by Cricut. But there are many ways to make the center for giant paper flowers. Let’s your creativity bloom. Here is an example of 1 layer with 6 petals giant flower. 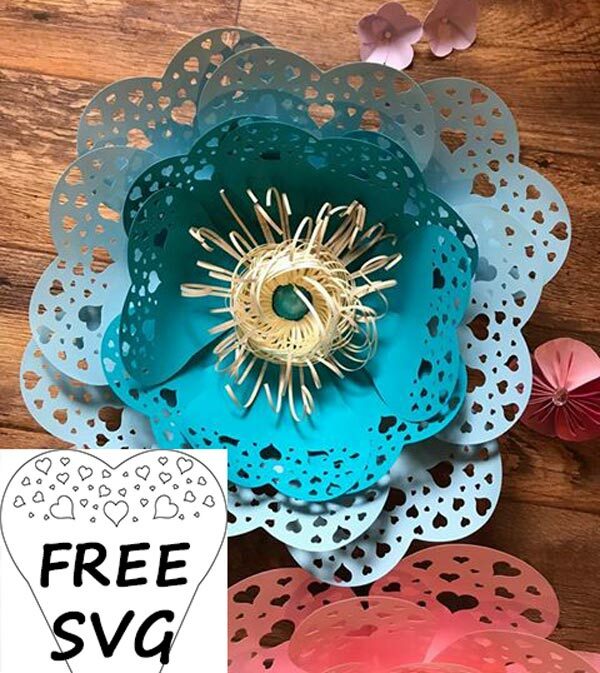 The petals have many intricated cut, so I used Cricut. At first, I tried to make this beauty with just 5 petals but it looks weird. 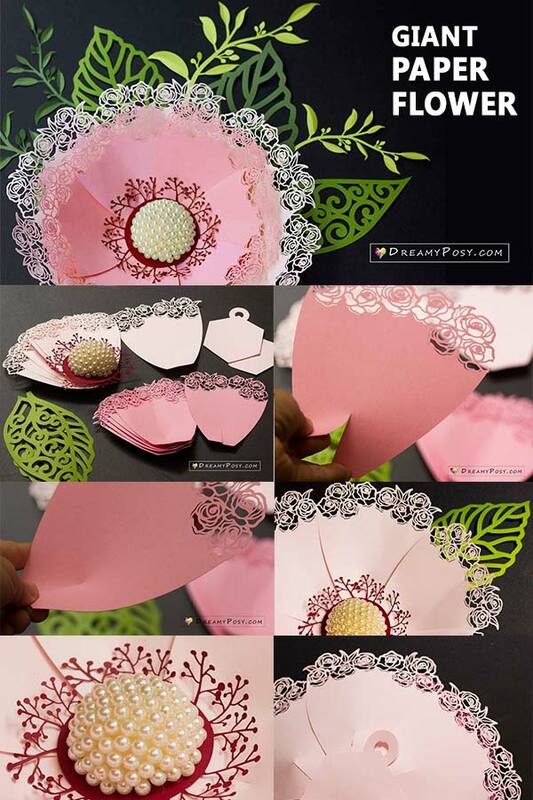 Please check the tutorial and template for this paper flowers craft here. Here is the 4-layers-giant flower. Each layer has 4 petals, with 2 different sizes. 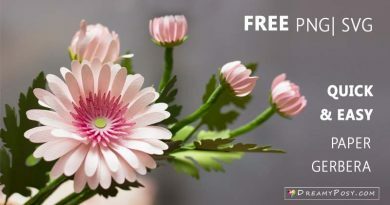 You can find the free template and tutorials to make above 3 flowers here. 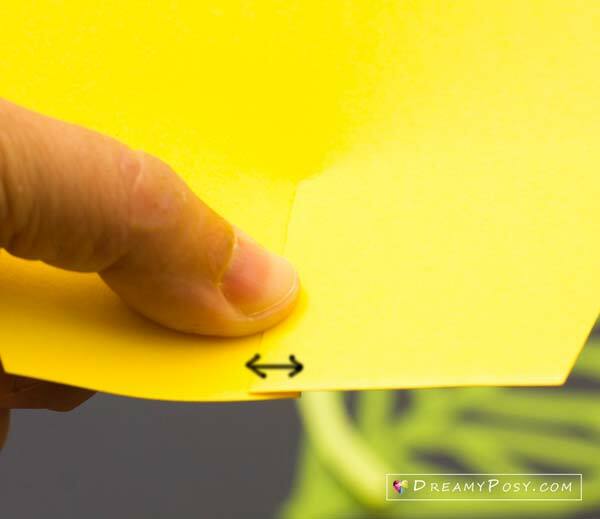 Below are some other quick picture tutorials. The above Olivia flower was made by Farrah Coloma. Follow her Instagram page. She teaches giant paper flowers classes in California. Wow you are sooo talented! Thanks for sharing! The template is 3$/each. Please paypal me to https://www.paypal.me/dreamyposy the amount of money, and email your detail order to [email protected]. I’ll send you the SVG templates.